I’ve said it before, and I’ll say it again – I love when people give me food to try and review for Grandma’s Backyard. There is almost nothing better when it comes to getting to try food products. On Tuesday, Yoko from work returned from Japan and brought with her some Japanese Kit Kat bars. She so graciously gave me a pack of each flavor she brought with her to try. I was totally stoked as soon as I got them and totally loved the boxes – nearly everything on them was in Japanese and the calories were in kcal…schwing. I brought them home and after dinner, it was time to try them. On behalf of one of Taylor’s friends Moms, this was some good ol’ Japanese Techno. I decided to first try the variety of Strawberry. Thanks to my lack of Japanese, I only knew these were strawberry by the images on the box. Upon opening the box, I found individually packaged Kit Kat – 2 in each pack. I opened up a pack and found them to be a little bit smaller than the normal sized Kit Kat…more along the size of the Halloween variety. 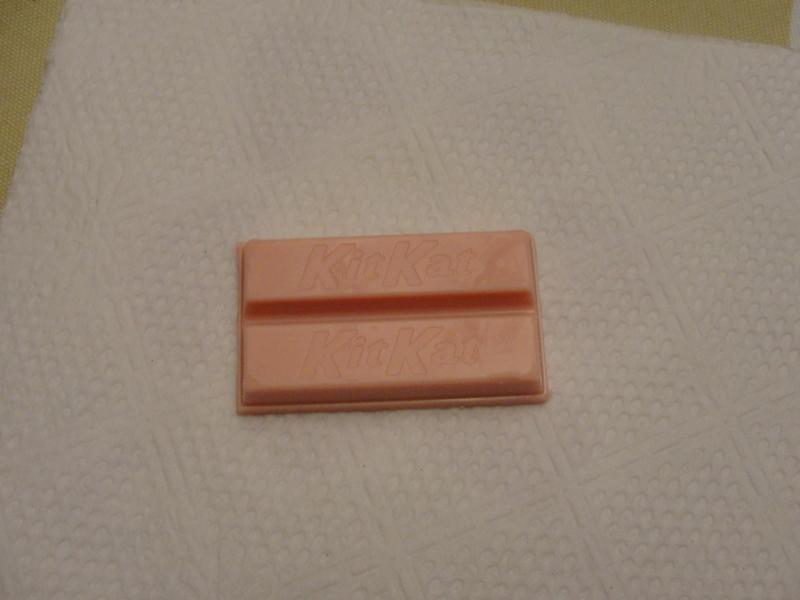 My first thought was that this was going to taste like some Strawberry Quik – the Kit Kat was that exact color. I was unsure if I should be expecting anything similar to the US Kit Kat and did not see any chocolate. Without thinking further, I bit right in. Well, the flavor was indeed quite different. While not quite along the lines of Strawberry Quik, I could indeed taste the strawberry flavor. The exterior coating seemed to be white chocolate, heavily flavored with strawberry. 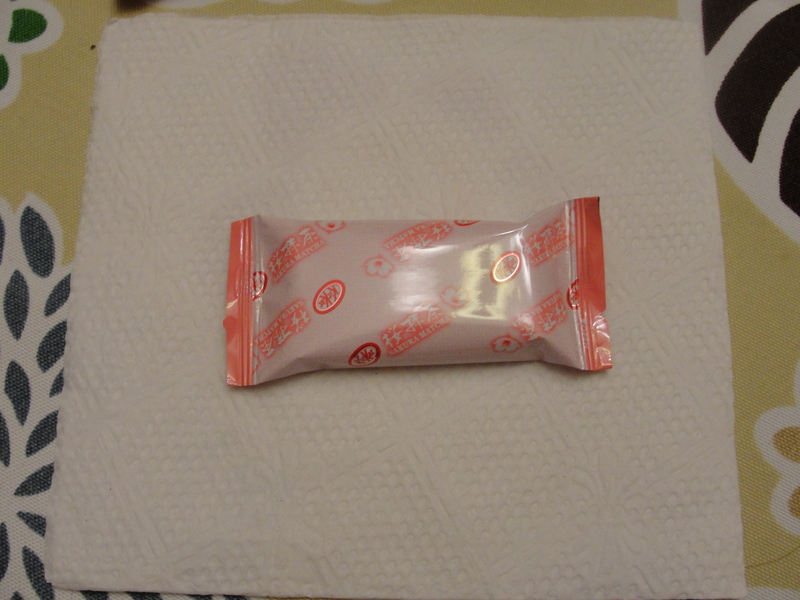 The flavor was more intense when I first began to eat the piece and it seemed to lessen as I finished and swallowed it. The interior of the Kit Kat was your traditional wafer filling – delicious as always. However, I did not feel as if the Strawberry exterior really played well with the interior. It felt to me like two different pieces, forced to sit together and be friends. Sorry friends, it’s just not going to happen. I finished my piece but did not feel inclined to eat any more. After cleansing my palate with some water, I decided it was time for the green tea variety. Looking at the box, I would have guessed this was a green smoothie flavor however, I was informed that it was indeed green tea. Going into this one, I had no idea what to expect. 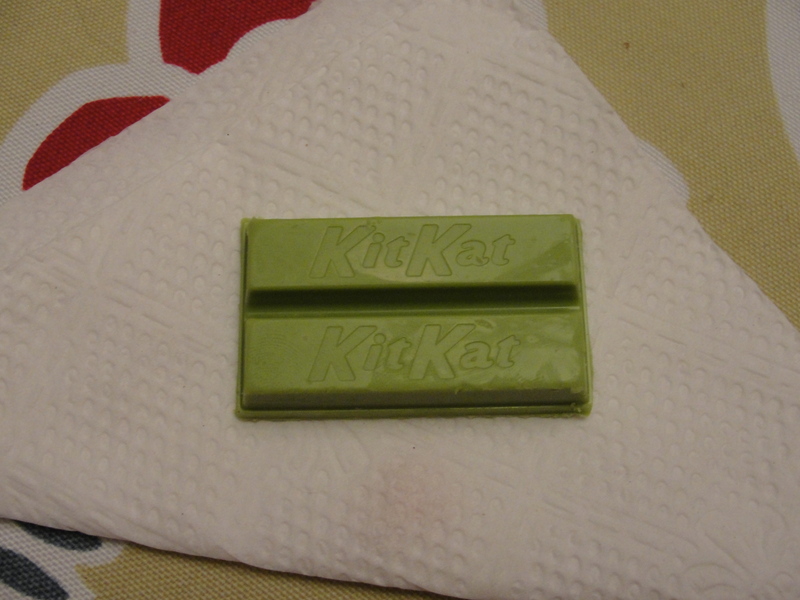 I find the flavor of green tea to be somewhat bitter and I could not imagine how this was going to play into the actual flavor of the Kit Kat. I loved the color of this thing – so classic pea soup green – it was awesome. I took a Brake and began to eat. Right away, I liked this Kit Kat wayyy more. The flavor of the white chocolate was much more apparent and, as far as I could tell, there was no green tea. I guess it did have a little bit of a back taste – like something was mixing with the chocolate – but, it was not strong enough to allow me to figure out quite what it was. The crispy wafer paired much better with the pea soup green white chocolate. This was crispy, refreshing and just sweet enough. I loved this one and can totally see myself going back and eating the rest of the box. While not quite a US Kit Kat, this thing was awesome in its own sense. So, lesson to be learned here – bring Nicki food to try and blog about. I love the fact that not only did Yoko bring me in something but, that something came all the way from Japan. I’m sure that I will end up eating the remainder of the Strawberry Kit Kat’s and perhaps the flavor will get better over time. For me, it just wasn’t there and I would have no reason to eat that over a traditional Kit Kat. 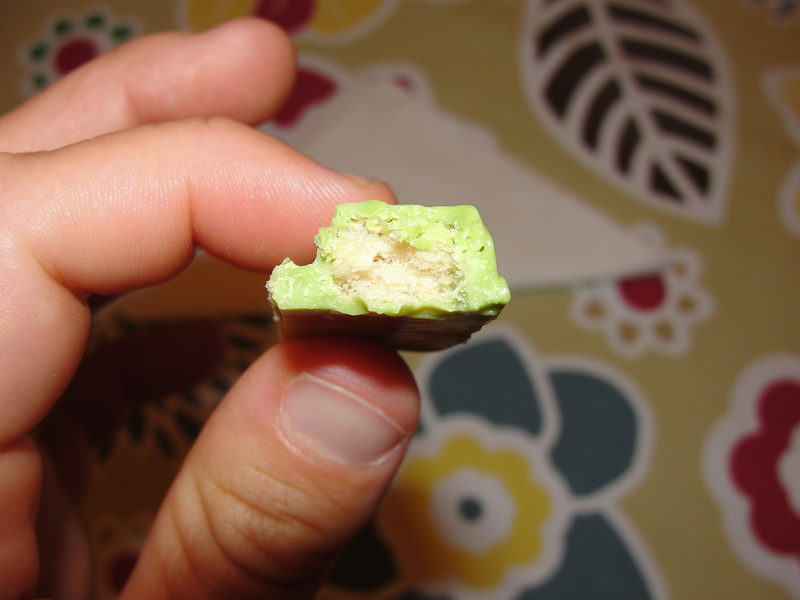 But, I will say, the Green Tea Kit Kat is pretty awesome. 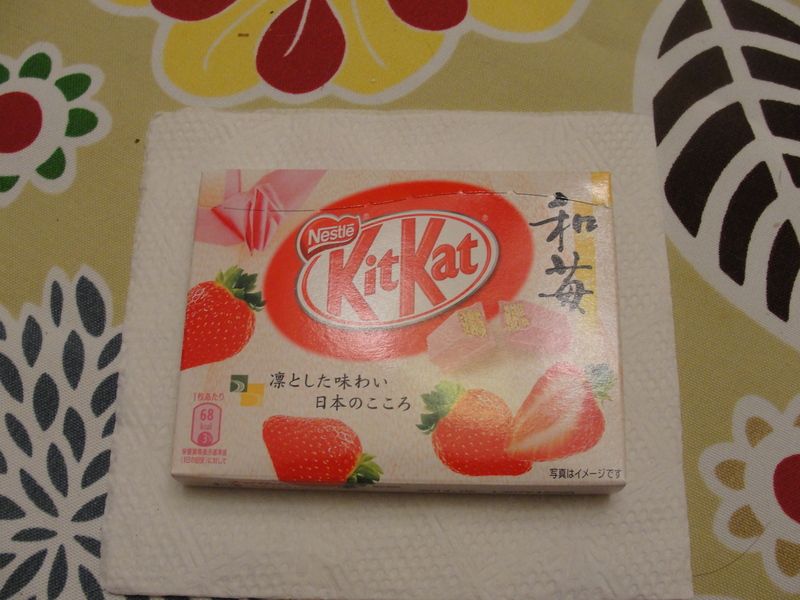 Try it expecting not a US Kit Kat but, I Kit Kat from Japan and I’m sure you will love it. So, grab your Walkman, cassettes and Japanese Kit Kat’s and let’s listen to some Japanese Techno.